Body hair can be quite unsightly if you don't get them removed. Same goes for your brows - they certainly don't look tidy if you don't get them trimmed. 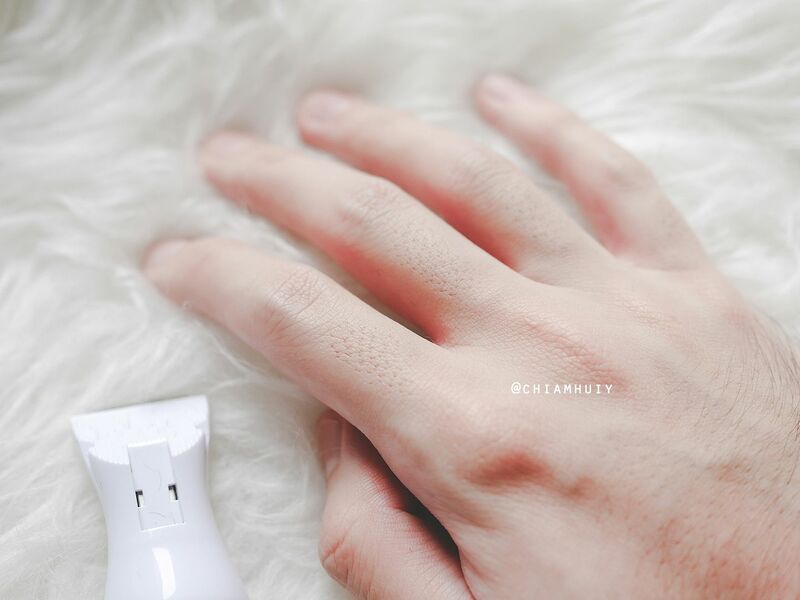 Body hair removal procedures ranges in a few types, and most of the times such procedures are quite expensive. 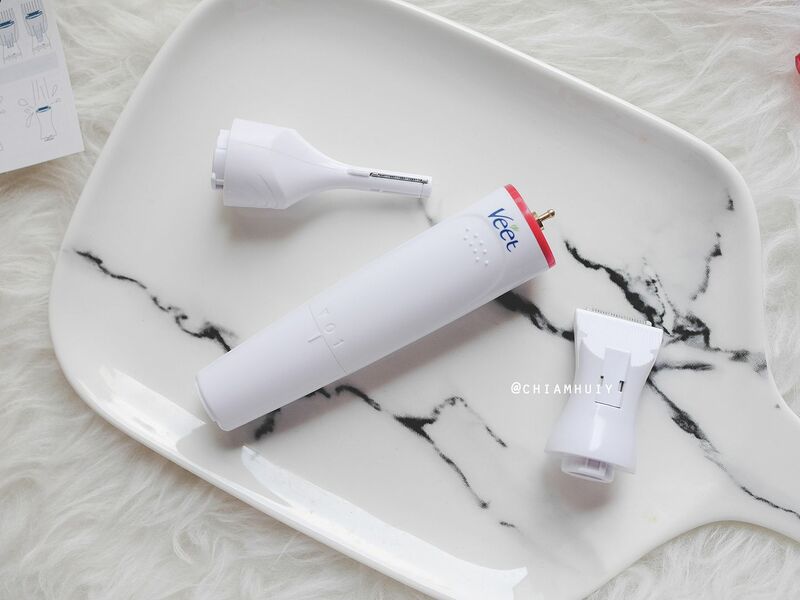 It's understandable that not many of us can afford such expensive treatments, so most of us ladies would turn to shavers or electronic shavers, so to speak. 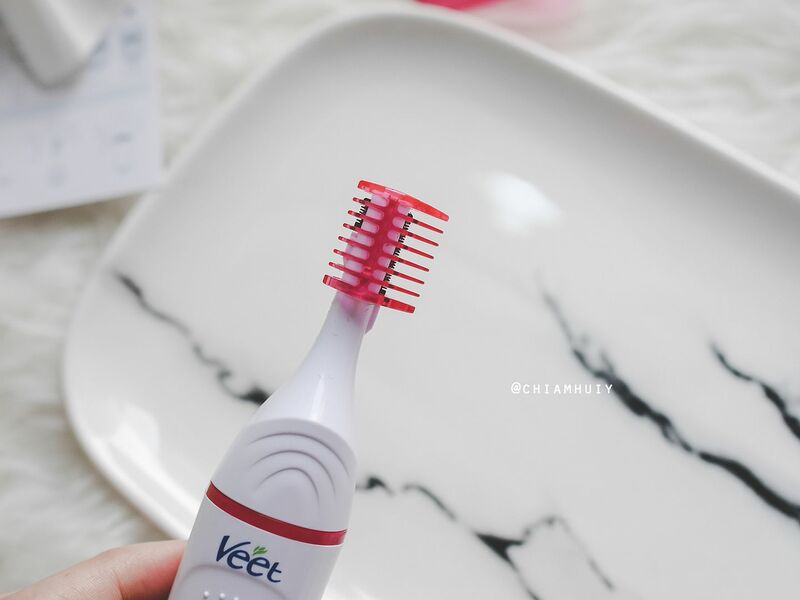 Veet is one of the most popular brands ladies have been using for hair removal solutions. 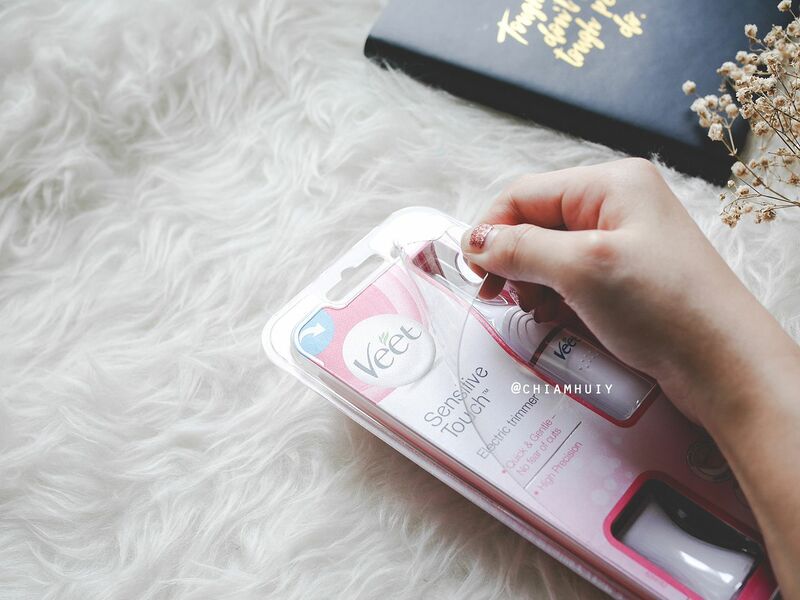 This time round, they have came up with an invention - the Veet Sensitive Touch™ Beauty Trimmer, without the fear of cuts! 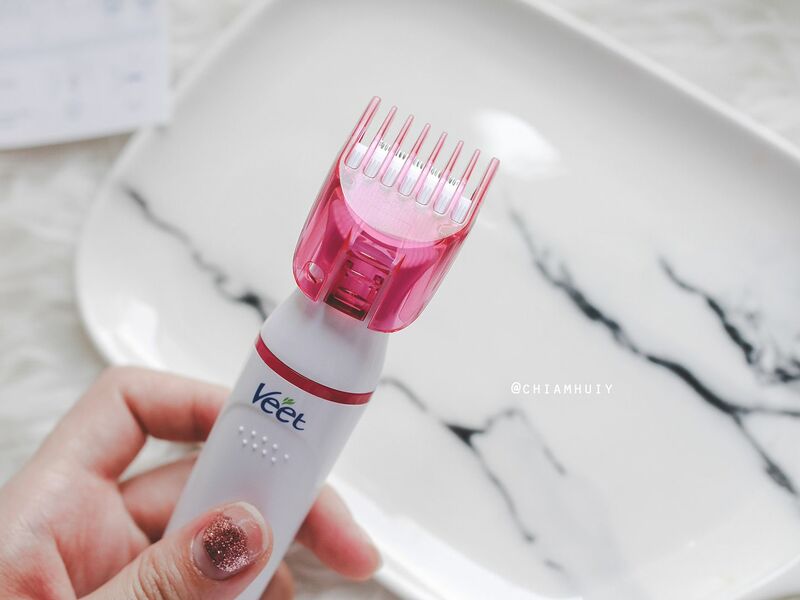 Veet Sensitive Touch™ Beauty Trimmer is the very 1st device from Veet designed to gently trim yet precisely shape sensitive body parts, such as face, bikini and underarms. 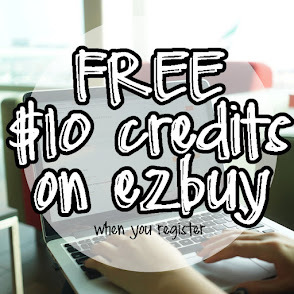 A one device that comes with several functions. The best thing is, it's only retailing at SGD 44.90, which I think is a very affordable price. The device runs on an AA battery, which is included in the box too. 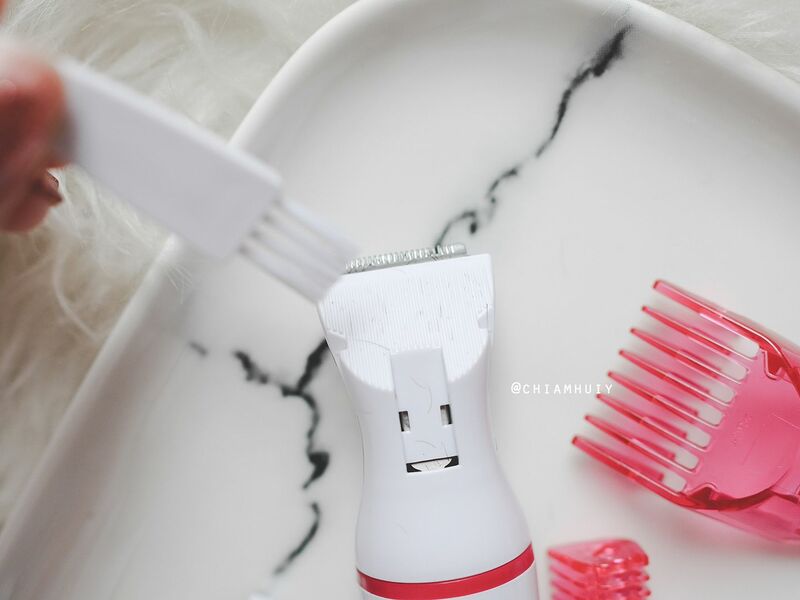 It sure does look scary to see the mini blades that form the Bikini trimming head. 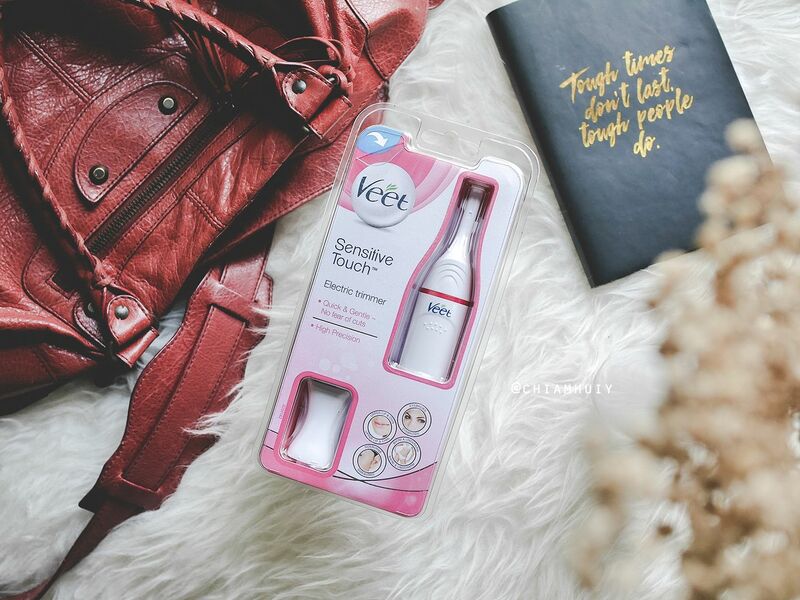 However, the key selling point about Veet Sensitive Touch™ Beauty Trimmer is that the blades do not cut. 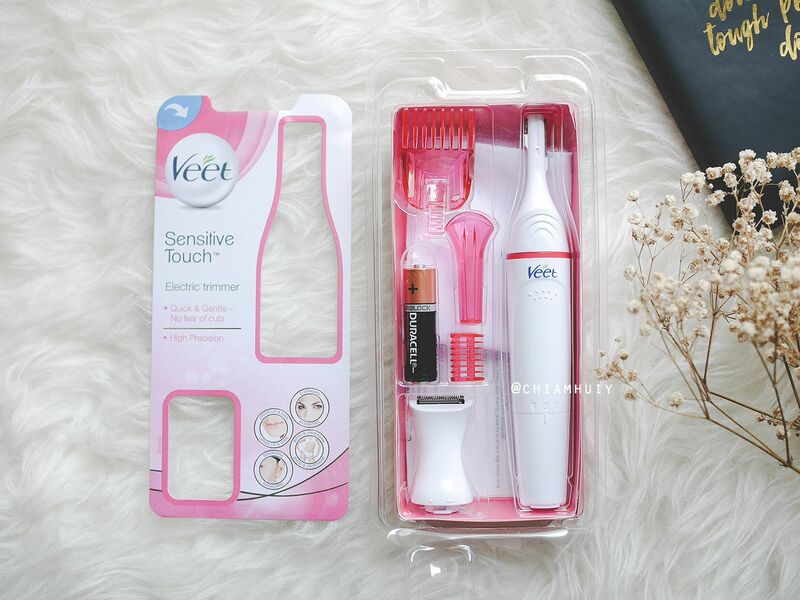 The cutting blades are specially designed to never touch your skin during usage, hence no risk of cuts. 2-sided trimming head: 16mm and 6mm for optimal eyebrow shaping. 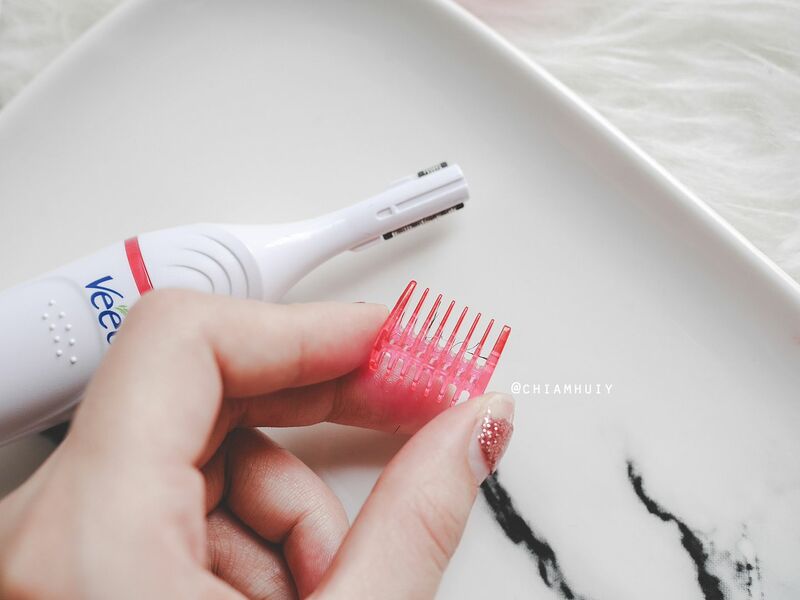 When placed with 2mm and 4mm comb attachment, it can be used to trim and uniform hair length of your eyebrow. I admit I took awhile to overcome the fear of placing the trimming hear near my brows! Can't blame someone who at times suffer from cuts when I use those normal eyebrow trimming blade. 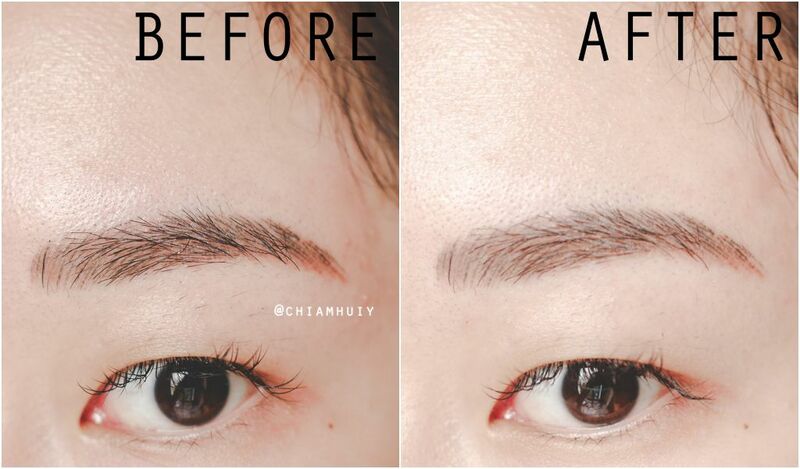 If you're not careful, especially for the novices who are new to trimming their eyebrows, using a trimming blade can results in a few deadly tiny cuts. 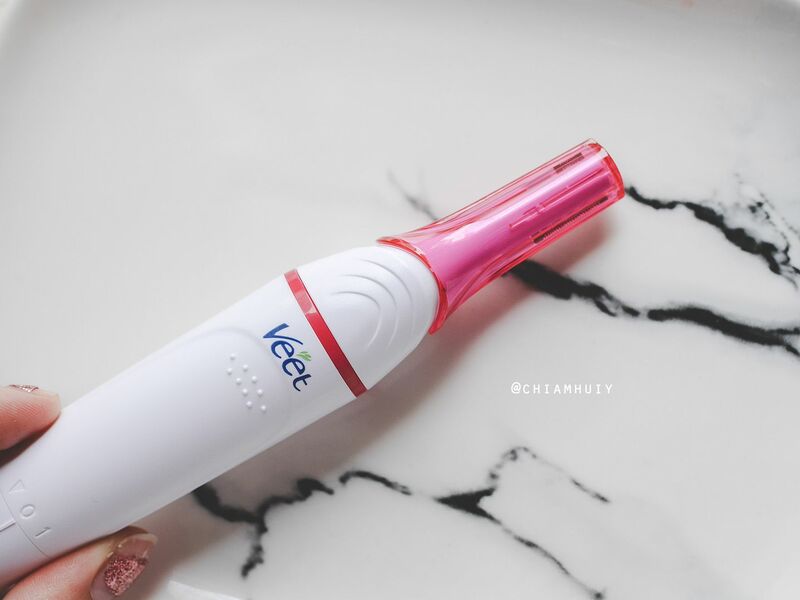 Thankfully, this didn't happen at all with Veet Sensitive Touch™ Beauty Trimmer, so I am absolutely impressed. It only feels a little tingly due to the vibration of the device. 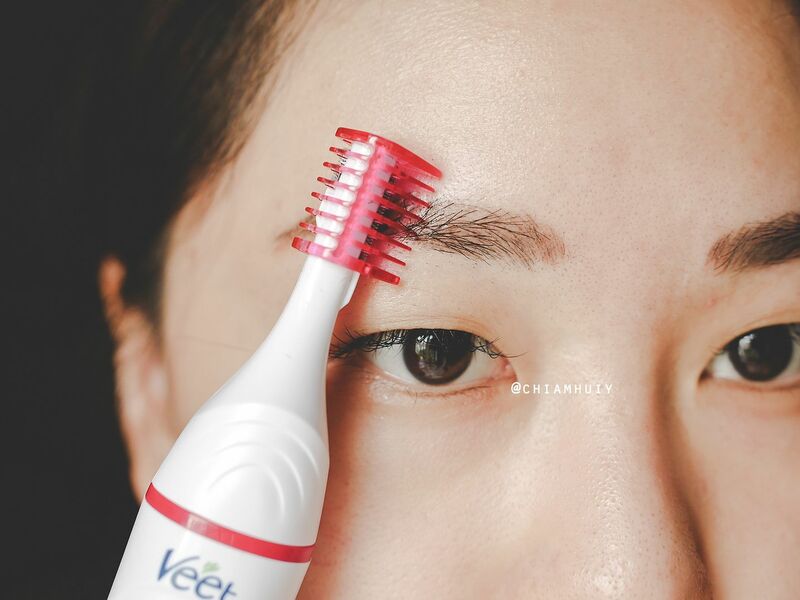 As you can see, it can even remove the finest hair on my eyelids! I guess picture tells a lot. 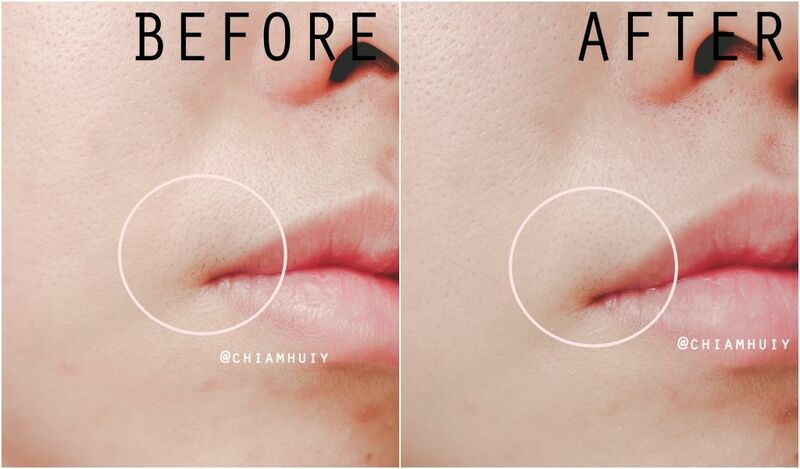 Even the tiniest and finest upper lip hair can be removed. 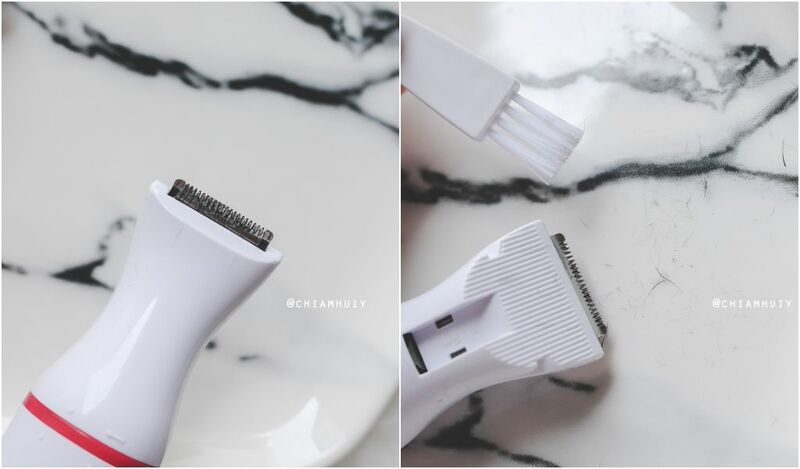 If you have really thick eyebrows, you can use the comb attachment for eyebrow trimming. 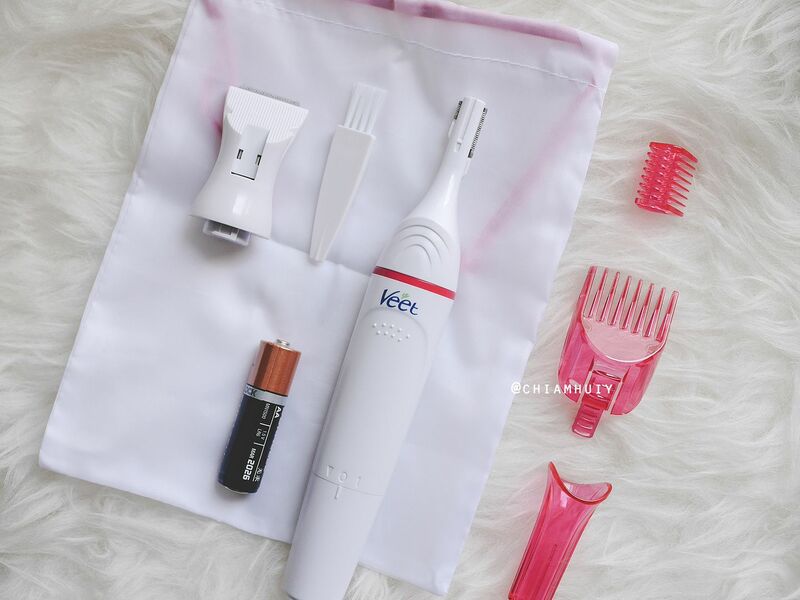 Sweep against the growth of your hair and the device will trim the excess hair that is protruding out. 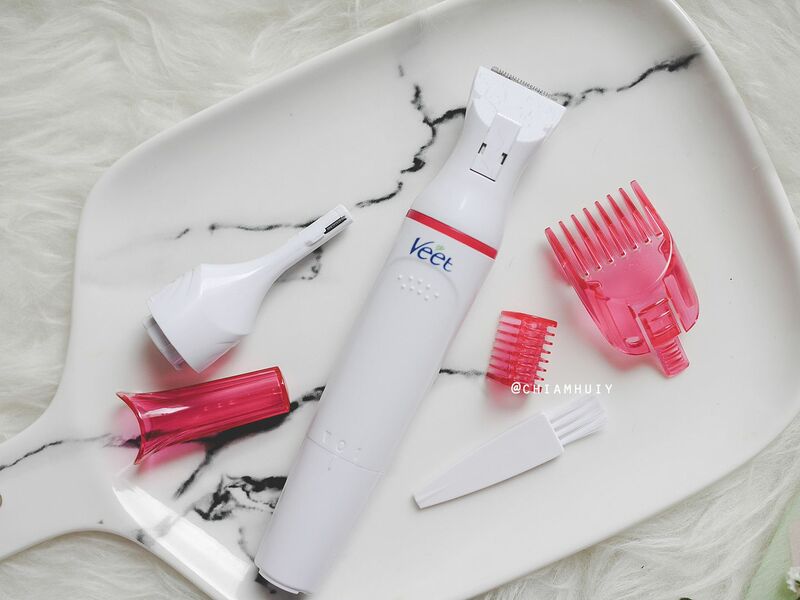 You can also use 20mm trimming head for other body areas with comb attachment to uniform hair length. 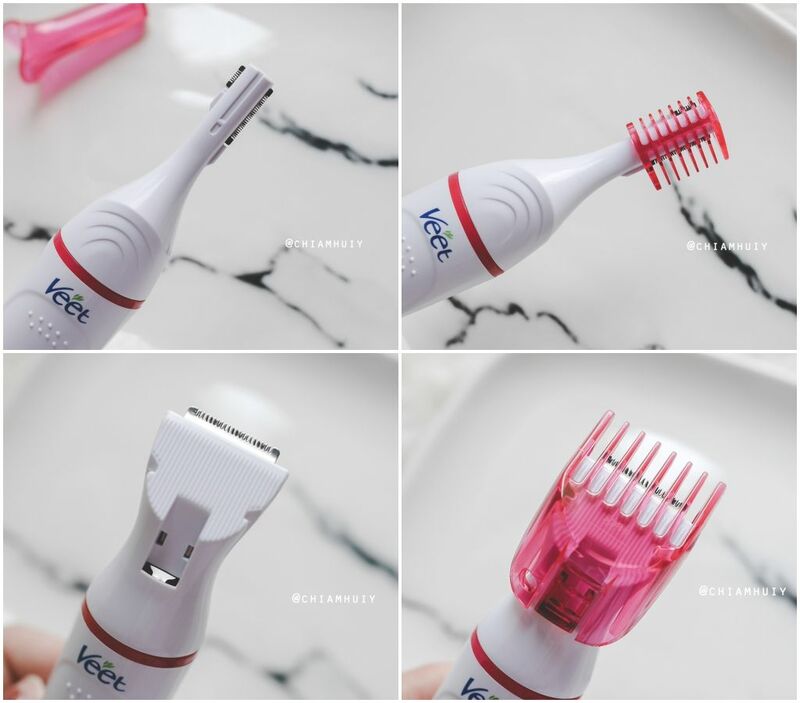 Otherwise, you can remove the comb attachment for complete hair removal. 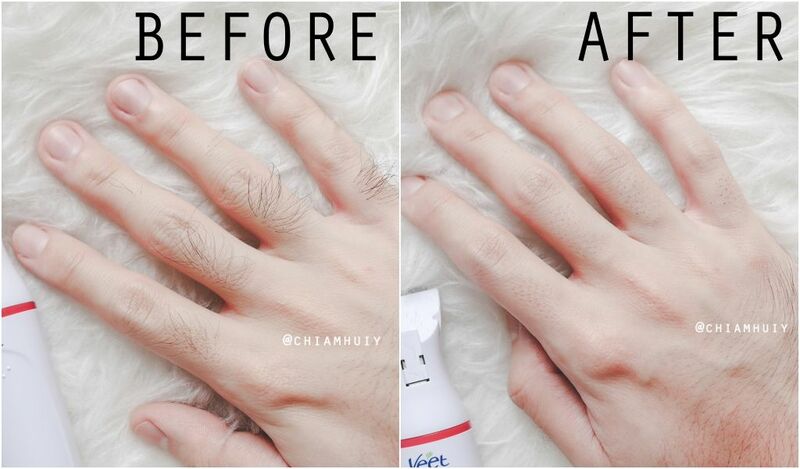 Removal of body hair with no fear of cuts. Yes, there is no pain at all. Even hair on the fingers are not to be spared! 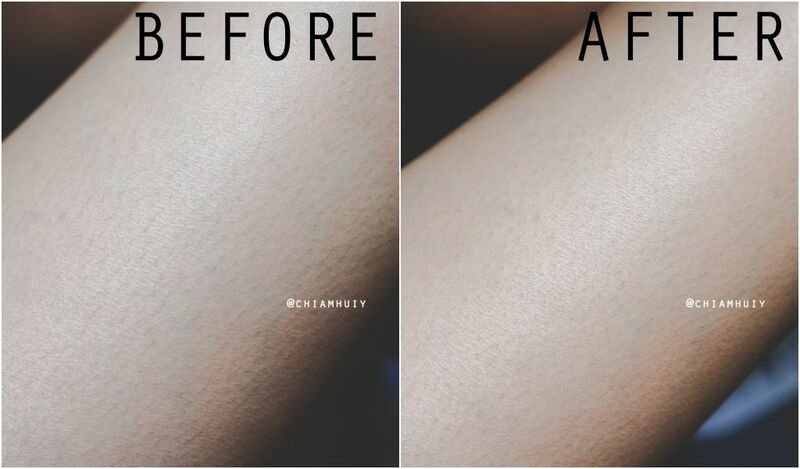 Amazing results right? 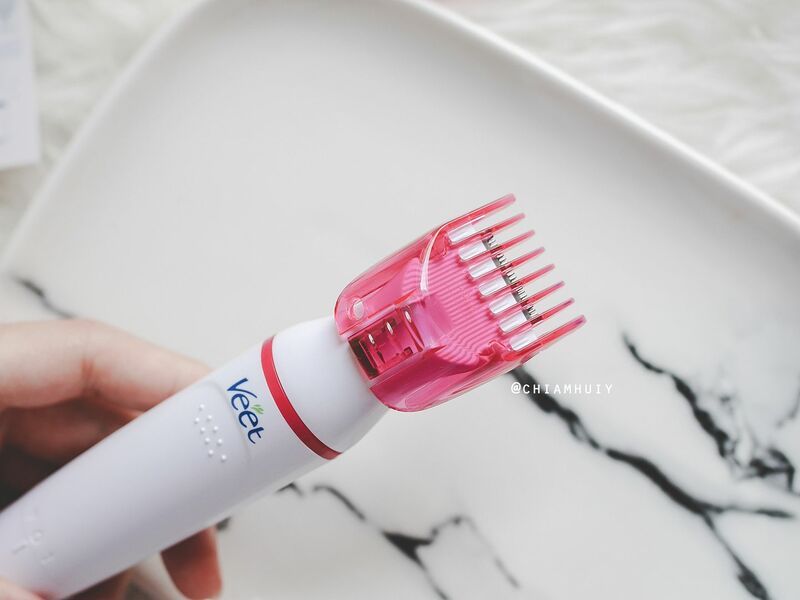 Hair can now be easily removed without fearing of potential cuts. Likewise, you do not have to use with shaving gel or foam. 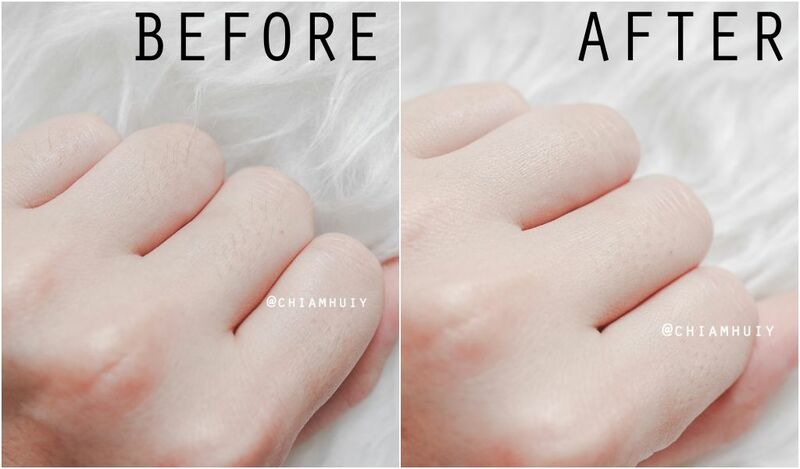 Use on dry skin only. 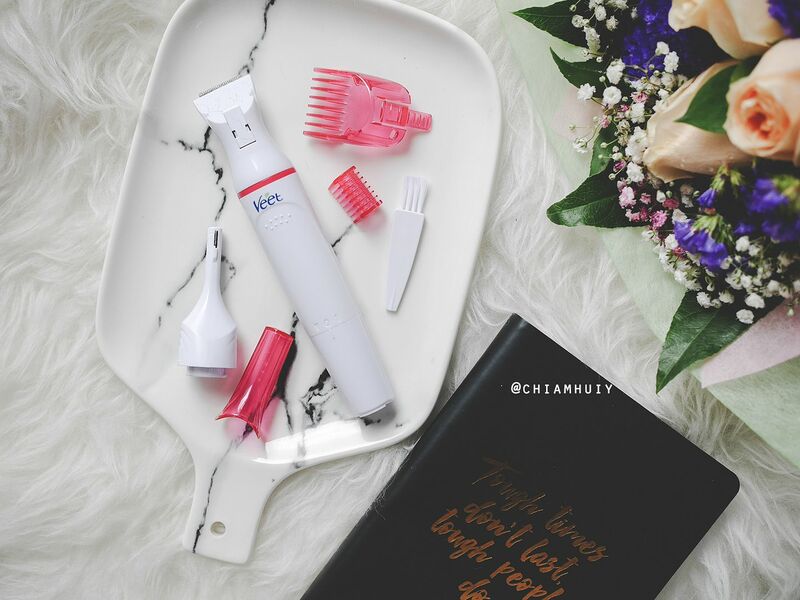 The box comes with a brush for cleaning up after usage. 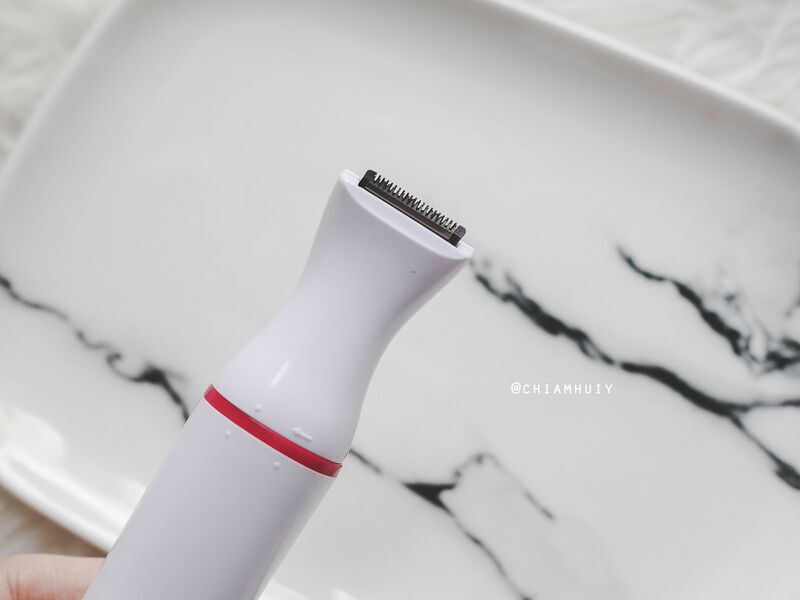 You can also detach the trimmer heads and wash with water. DO NOT wash the device with water though. The packaging was very well thought out too. 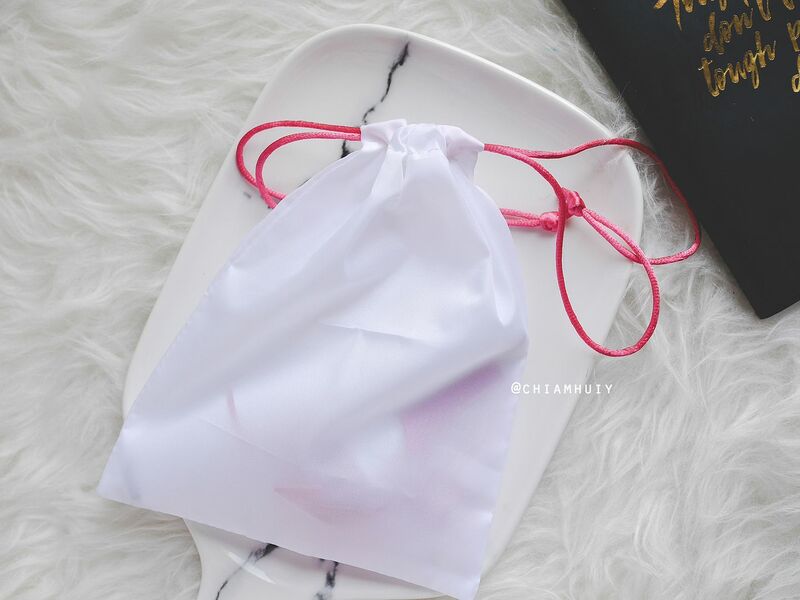 It can be easily opened without requiring scissors. 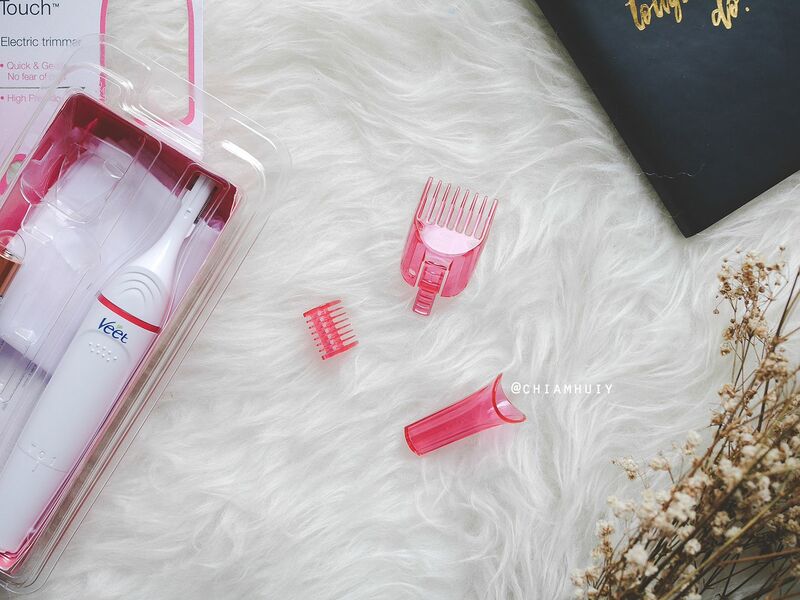 Recommended to use the brush to clean off the hair. 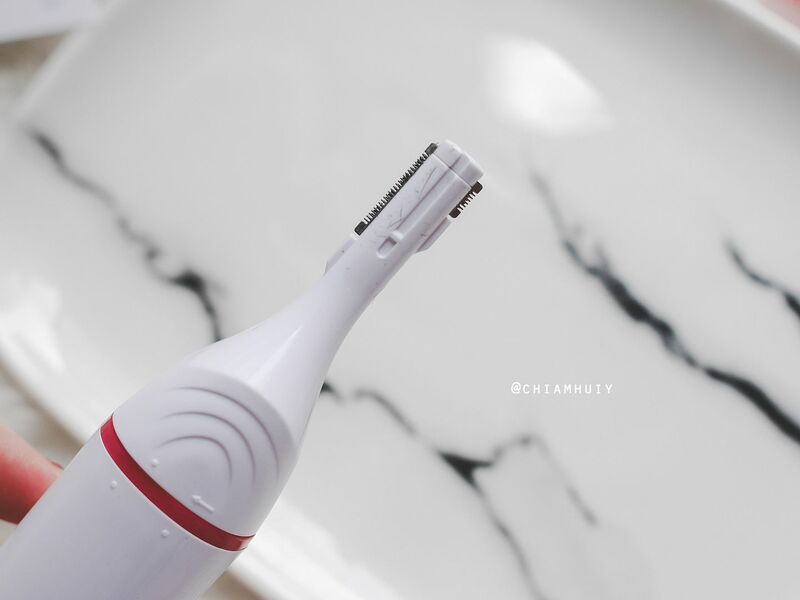 Also add in lubricant oil and let it run for a few seconds to prolong the usability of the blade. 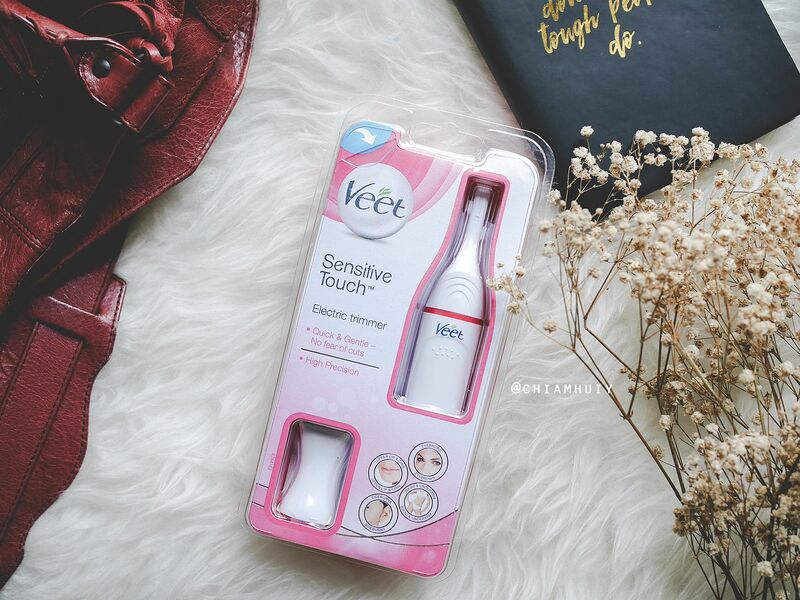 You can purchase Veet Sensitive Touch™ Electric Trimmer from Guardian here. It retails at $44.90, but seems like there's a promotion going on!